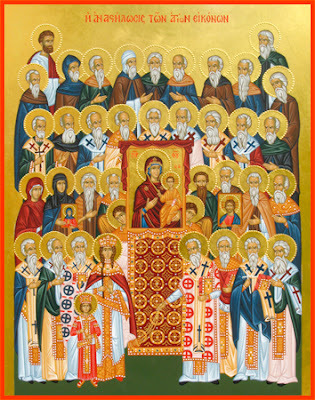 The Sunday of Orthodoxy. Do not forget the right word which you spoke to God, renewing your covenant with Him which you broke through your negligence. Remember how and why you broke it and try to avoid being unfaithful again. Pretty words are not glorious; faithfulness is glorious. Is it not glorious to have a covenant with a king? How much more glorious is it to have a covenant with the King of kings! But this glory becomes your disgrace if you are not faithful to this covenant. How many great people have been glorified since the beginning of the world! And all of them have been glorified for their faithfulness, in which they stood firm, regardless of great misfortunes and sorrows as a result of this faithfulness. They had trial of cruel mockings and scourgings, yea, moreover of bonds and imprisonment: "They were stoned, they were sawn asunder, were tempted, were slain with the sword: they wandered about in sheepskins and goatskins; being destitute, afflicted, tormented; Of whom the world was not worthy: they wandered in deserts, and in mountains, and in dens and caves of the earth…. Wherefore, seeing we are compassed about with so great a cloud of witnesses, let us run with patience the race that is set before us, looking unto Jesus the author and finisher of our faith (Heb. 11:36–38; 12:1–2). The first Sunday of Great Lent is called “The Sunday of Orthodoxy,” and celebrates the restoration of the veneration of Icons and the victory of Orthodoxy over the Iconoclast heresy.